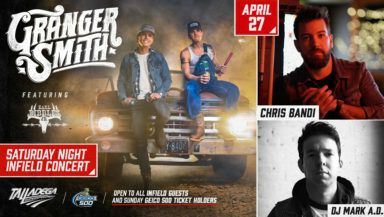 TALLADEGA, Ala. – One of Nashville’s most exciting up-and-coming artists – Chris Bandi – will open Talladega Superspeedway’s traditional Saturday Night Infield Concert – headlined by Granger Smith featuring Earl Dibbles Jr. – on April 27, part of NASCAR’s Most Competitive track’s anticipated spring motorsports tripleheader weekend. Bandi, the singer/songwriter who has a diverse musical taste flavored by his youth in St. Louis, will get the crowd rocking before turning the stage over to country music chart-topper Smith featuring Earl Dibbles Jr., who has amassed a massive and rabid audience known as the “Yee Yee Nation” over the course of his ground-breaking career. Admission to the Saturday Night Infield Concert, which also features DJ Mark A.D. from Birmingham, AL, is FREE to all infield guests and anyone who purchases a ticket to the GEICO 500 Monster Energy NASCAR Cup Series race on Sunday, April 28. The concert takes place at the intersection of Eastaboga and Talladega Blvds. Bandi launched into 2017 by earning a spot on both The Boot’s “10 New Country Artists To Watch” list and The Shotgun Seat’s “17 for 17: Country Artists To Watch This Year.” His debut single “Man Enough Now” has garnered over 3 million streams on Spotify alone, where it was added to the “Wild Country”, “New Boots” and “Hot Country” playlists. His second single, “Gone Girl” (Bandi, Massey, Forest Glen Whitehead), premiered February 10 exclusively with Taste of Country. Since its release, it has been added to Spotify’s “Wild Country” playlist and has been streamed over a quarter of a million times. Bandi is currently writing and recording new music for an upcoming EP. Smith featuring Dibbles Jr. broke onto the national scene with debut album Remington. The album skyrocketed to No. 1 on the iTunes country albums chart, with lead single “Backroad Song” hitting the No. 1 spot on the Billboard charts. Smith released his current album When the Good guys Win, in 2017 and it soared to No. 2 on the Billboard chart. He and Dibbles Jr. have toured and performed with top-country artists such as Luke Bryan, Florida Georgia Line, Garth Brooks and more. The Saturday Night Infield Concert festivities are scheduled to start at 7 p.m. CDT, which kicks off just hours after the conclusion of the MoneyLion 300 NASCAR Xfinity Series event (noon CDT) and qualifying for the Monster Energy NASCAR Cup Series’ GEICO 500. The GEICO 500 is set to get the green flag on Sunday, April 28, at 1 p.m. CDT. For more information about the Saturday Night Infield Concert, visit www.talladegasuperspeedway.com or call 855-518-RACE (7223). The action-packed weekend kicks off on Friday, April 26, with the General Tire 200 ARCA Menards Series event. The historic 2.66-mile venue is also celebrating its 50th anniversary this year along with Transformation – The Talladega Superspeedway Infield Project presented by Graybar. The new Turn 3 Oversized Vehicle Tunnel, as well as the new Finish Line Premium RV area (includes full hookups) and new Infield Shower Trailers, are scheduled for completion in time for the tripleheader weekend. The culmination of the project will occur in October with a one-of-a-kind Talladega Garage Experience, which will feature “up-close” access, interactive attractions and enhanced amenities. For more information, visit www.talladegasuperspeedway.com/transformation. ABOUT GRANGER SMITH FEATURING EARL DIBBLES JR.